Just sitting here sipping a Sangria and reflecting on the kids' birthday party today. First off, it was a success, but the morning started off with a bit of a snag. There are two gazebo pavilions you can rent at the park. I had reserved Gazebo A from 10-2. And apparently two other parties were double-booked for Gazebo B for the full day. A very crabby lady in gray-sweatpants (who will be referred to as Gray-Sweatpants from here on) approached me to ask for my paperwork, proving that I had the rights to Gazebo A.
Yeah, I had them... at home, on my desk. Talk about stress just as our party was starting. Thankfully it turned out so we kept our original reserved spot and they duked out the details between themselves. I had a party to get started. And partying we did. 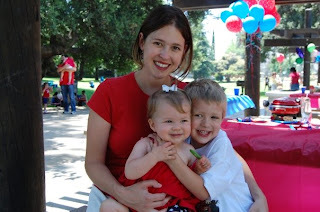 It was a patriotic-themed party (inspired by the fact that the 4th of July is exactly halfway between the kids' birthdays - with Addie's on the first and Dylan's on the 7th of July). 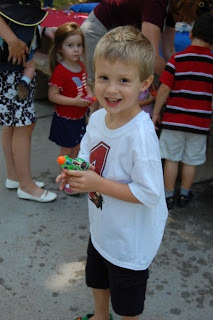 Dylan had a blast with his friends, running around with water guns decorated up with 'Cars' stickers (per his request), throwing water balloons (provided for the kids to toss at their daddys, courtesy of Kathy), drinking juice boxes, eating lots of fruit snacks and hotdogs. 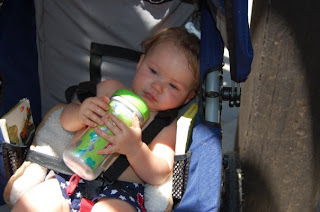 She also enjoyed the swings and watching her big brother run around with his buddies. 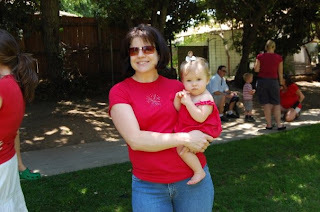 Here she is with Christy, just after the water balloon fight. At the end of the party, Addie was wiped out, shirtless and sticky from cupcake icing, and overdue for her afternoon nap. Meanwhile, Dylan somehow had energy to spare. So when we got home, he unwrapped their gifts, took his bath, came along with Kathy and I to get my Saturday Flowers, the grocery store, Panera for dinner take-out (all while Addie napped), and continued to play non-stop until nearly 8pm! Thanks for a great party. Had fun!!! Happy Birthday to the kids! 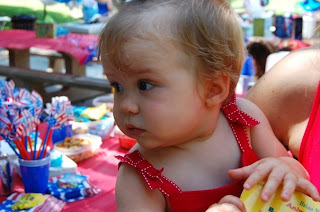 It is hard to believe that Addie is already 1! Happy Birthday Dylan and Addie. I can't believe Addie is one! What cuties. Sounds like the Sangria was well deserved.